The head of the Nazis’ homicidal “Jewish Department” who zealously managed the transport of millions of innocent people to death camps vanished after World War II. 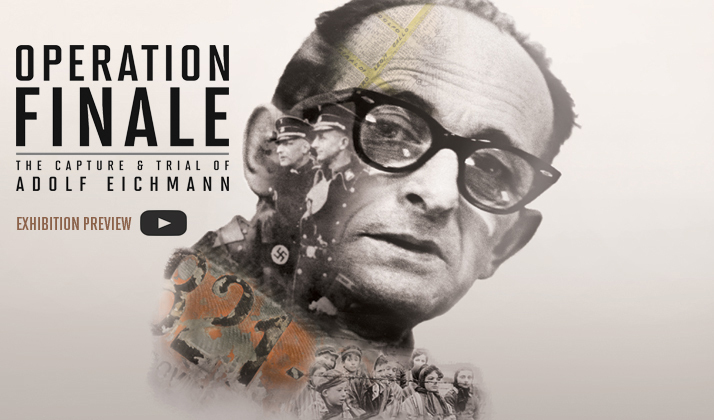 Photographs, film and recently declassified spy artifacts reveal the dramatic secret history behind the daring abduction and globally broadcast trial of a principal perpetrator of the Final Solution. This world premiere exhibition is a co-production of Beit Hatfutsot – The Museum of the Jewish People, Tel Aviv, Israel; The Mossad – Israeli Secret Intelligence Service and the Maltz Museum of Jewish Heritage. Get a video preview of the exhibition here. Check back. Dates added as contracts confirmed. Want to bring the exhibition to your museum? Contact Lindsay Miller, Manager of Collections & Exhibitions at 216.593.0580 or email lmiller@mmjh.org.